By buying this product you'll earn up to 149 Rewards points. If you need to install pro audio equipment in a venue where cable runs and drilling are not desireable — a historic church, for instance — the Denon DN-202WT can help you get the job done right. Plug your source or mixer into the transmitter, and it will wirelessly send audio signals up to 100 feet away, to one or more Denon DN-202WR receivers. Can I use this with a standard Denon home theater receiver for nstead of buying the companion receiver? 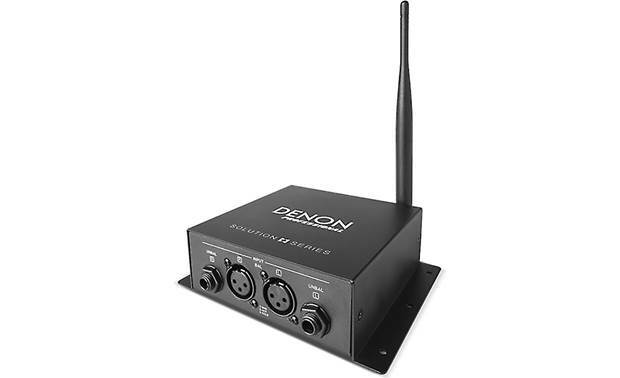 Overview: The Denon DN-202WT is the perfect solution getting an audio signal to places that would be difficult, inconvenient, or applications where unsightly cable runs or drilling of holes is not permissible. Paired with the DN-202WR receiver (sold separately), this combo allows audio transmissions through walls and ceilings up to 100 feet away. The DN-202WT is ideal for event spaces, houses of worship, entertainment venues, educational and retail applications, and more. Wireless: The DN-202WT operates on a 2.4 GHz transmission frequency (2.404 - 2.476) with greater than 1.8 MHz of bandwidth. Its high-quality audio transmission has a frequency response of 20 Hz - 20 kHz (+3 dB) with a signal to noise ratio of greater than 80 dB. The transmitter's built-in articulating antenna can be rotated up to 180˚ and tilted up to 90˚ allowing for a transmission range of up to 100 feet. The DN-202WT can be paired to multiple DN-202WR receivers, allowing you to transmit a single audio source to multiple locations at an event or indoor/outdoor/multilevel venue. Stereo/Mono: This button allows signals to be transmitted in either stereo or mono. Peak Indicators: Two LEDs indicate if either of the stereo input signals start to clip. Pairing Button: Pressing this puts the transmitter into pairing mode for easy linking of DN-202WR receivers. Slow Flashing: Transmitter is not paired to a receiver. 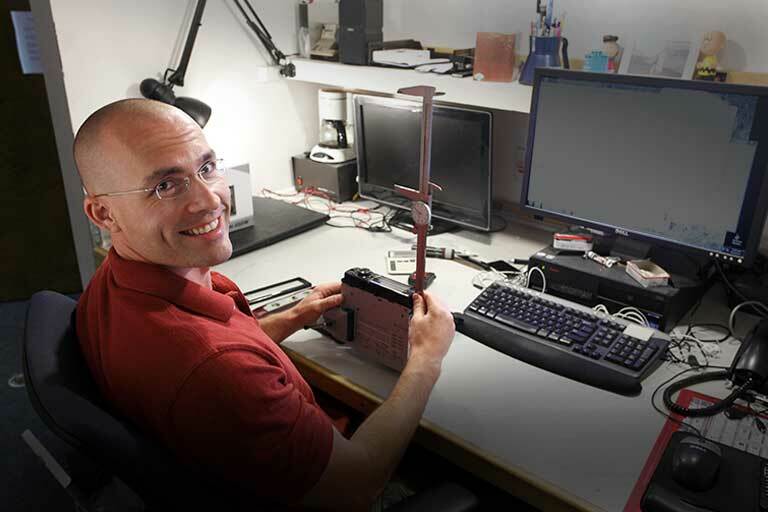 Rapid Flashing: Transmitter is in pairing mode and is "searching" for a DN-202WR receiver. Lit Solid: The unit is successfully paired to a DN-202WR receiver. Transmission Range: Up to 100 ft.
Dimensions: Width - 5.875",Height - 1.75" (7.375" with antenna upright), Depth - 5.750"
Can you use other receivers besides Denon? Would I be able to attach this to my old AVR2809 CI and stream music from my iPhone? 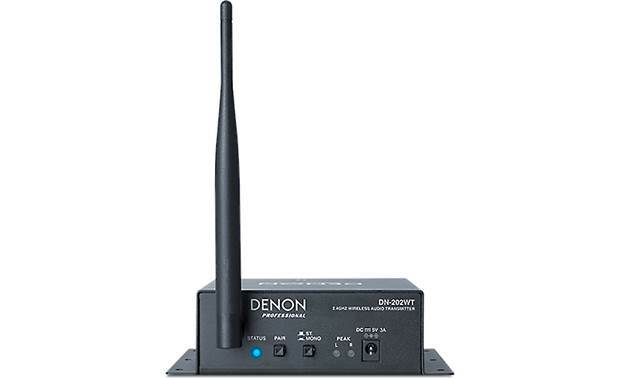 Searches related to the Denon DN-202WT Wireless audio transmitter.